Hibernian manager Neil Lennon is bracing himself for what he describes as the inevitable loss of midfielder John McGinn. Speaking yesterday, he said that the Scotland international is facing up to two months on the sidelines due to an ongoing problem with his ankle. But he would not reveal when that enforced lay-off will begin. The 22-year-old, who was voted the Scottish Cup winners’ player of the year, has been struggling with calcification of the ankle bone throughout this season. While the Leith club has been happy to benefit from his willingness to play through the pain barrier, Lennon has now admitted that it is inevitable that the side will be forced to cope without him for lengthy period at some point in the campaign. “He’s going to need surgery. It’s just how long he can go on. He has certain levels of discomfort at the minute but if you looked at his performance at the weekend you couldn’t tell. He was unbelievable. McGinn flew back from Scotland’s World Cup qualifier defeat to England last week and went straight into the Hibs side that drew with Falkirk to remain top of the Championship. But he has found it hard to hit the same heights he scaled last term and he has been in increasing pain in recent matches, with the ankle injury now taking its toll on other parts of his body. “He will be out for six to eight weeks, it’s something I don’t want to rush into but it will depend on how John is feeling,” said Lennon. 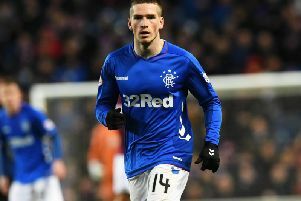 They are also trying to figure out when it would be best to schedule the operation to ensure he misses as few games as possible, and it is likely that neither the club nor player will want him sitting out the title run-in, while McGinn will be keen to be fit and available for Scotland’s next World Cup qualifier, against Slovenia, in March. “I’m not speculating on when he’s going to go in, it will be John’s decision at the end of the day, fully supported by us. It depends on how much pain or discomfort he is in, not just after games but during the week as well,” said Lennon. Hibs have better news on goalkeeper Ofir Marciano, who recently sustained a knee injury while on international duty with Israel. It led to him missing out on Saturday’s match but he is expected to resume training today and Lennon expects him to be available for tomorrow’s match with Queen of the South.